I recently had some time to explore the feasibility of network-level horizontal curve extraction using my previous iterative circular fitting algorithm. Working on GIS base maps is definitely more challenging than on the GPS trajectories, because of three primary reasons: 1) the density of the point sequence changes dramatically between a tangent section and a curved section, which needs a new mechanism to dynamically adjust the maximum iterations in the algorithm; 2) the intersecting sections of the road create confusion in the point sequences, which needs a better segmentation of the network before applying the algorithm; 3) divided highways occasionally have different curvatures, which need a better result-merging and book-keeping mechanism to minimize duplication in the results. The original algorithm can be found here in this paper (link), but I had to update the algorithm with additional steps to address the three challenges mentioned above. Here is a sample result for Lonoke County, Arkansas, using the improved algorithm. Obviously, Dr. Xu from the University of Nevada at Reno (link) and Dr. Li from the University of Louisville (link) have made a few steps ahead in applying their algorithms in a few GIS base maps. I hope soon I will be able to make a benchmarking among these state-of-art curve finding algorithms. In the meanwhile, I will try to collect different open base maps from state departments of transportation and share the network-level horizontal curve results using my improved algorithm. Hopefully, I will be able to accumulate enough results to create a national horizontal curve for most of the state highway systems. 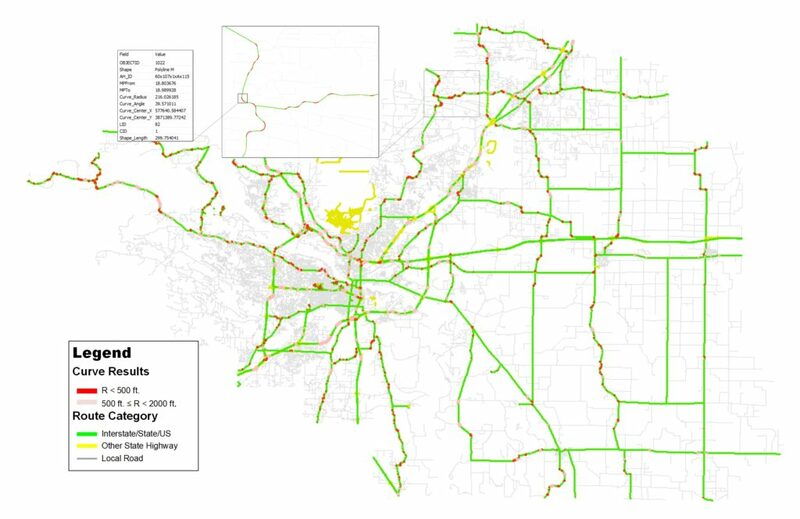 Of course, in a longer run, including local roads will create a whole new bunch of challenges, but that will be the next ambitious plan after the state highway systems.